Vangi Bath: Vangi bath (lit. 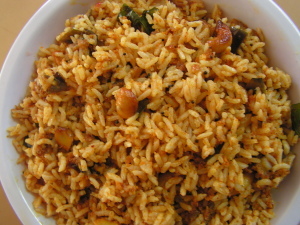 egg plant rice) is a super delicious rice dish which is very famous in Karnataka, Telangana and Andhra Pradesh. 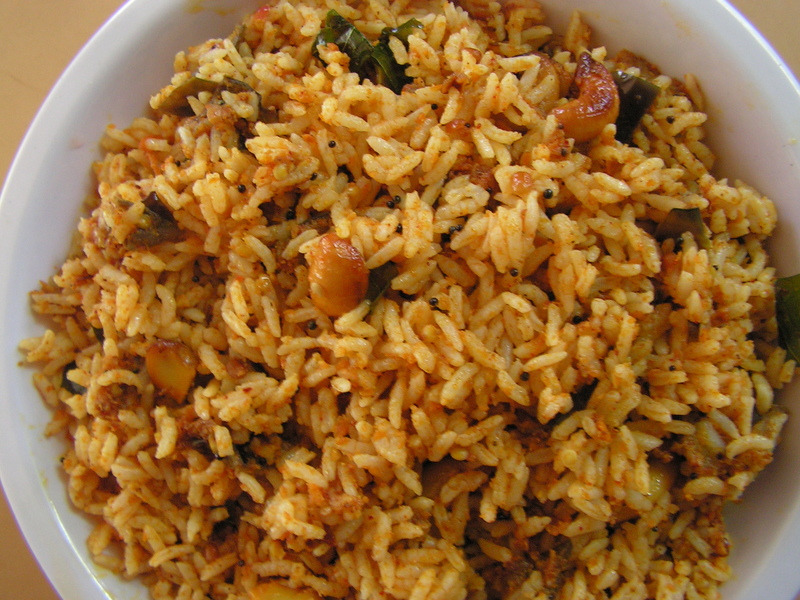 Vangi bath is generally prepared for breakfast and on some festival days like Vara Maha Lakshmi Vrata and Diwali. The main ingredients of vangi bath recipe are the vangi bath powder and brinjals. Dry roast all the ingredients under “To Powder” individually. Powder the dry roasted ingredients in a mixer or dry grinder to make vangi bath powder. Cut the egg plants into thin strips. Marinate the egg plant pieces in water mixed with some turmeric powder and salt. Add in the mustard seeds and cumin. When they splutter, add in the asafoetida and curry leaves. Sauté well till the onions turn transparent. Add the ginger, garlic and marinated egg plants. Sauté for 2 or 3 minutes till the egg plants are nearly done. Add in the potato pieces. Fry for 1 or 2 minutes or until the potato are well cooked. Add in the turmeric powder, vangi bath powder and salt, to taste. Sauté well till the mixture is coated nicely. Let the rice cook on low flame for 2 to 3 minutes. Add the sesame powder and groundnut powder. Vangi bath is ready to be served. If you have any queries regarding the Vangi Bath recipe, please leave a comment.